I work at a golf store where we install golf grips. Putter grips, in particular, have a flat flange that needs to be correctly aligned with the putter face. Eyeballing the installation isn't the easiest thing to do and we often are asked to re-grip putters because the manufacturer didn't do it correctly to begin with. This project utilizes the output of an accelerometer, powered by an Arduino UNO, to make sure the grip is installed perfectly straight. An external power source, as seen in the cover image, is powering the Arduino UNO. It's a 5 Volt, 1 amp battery. The variable resistor, seen in the schematic, controls how much voltage is allowed to pass through the LCD screen enabling the user to adjust the brightness of the output. The accelerometer is attached to a mini breadboard and on top of two strong magnets. These magnets hold this set-up on top of the grip as they attract to steel shaft of the golf club. This is a video of a golf grip being installed. The accelerometer is used to make sure it is on straight! 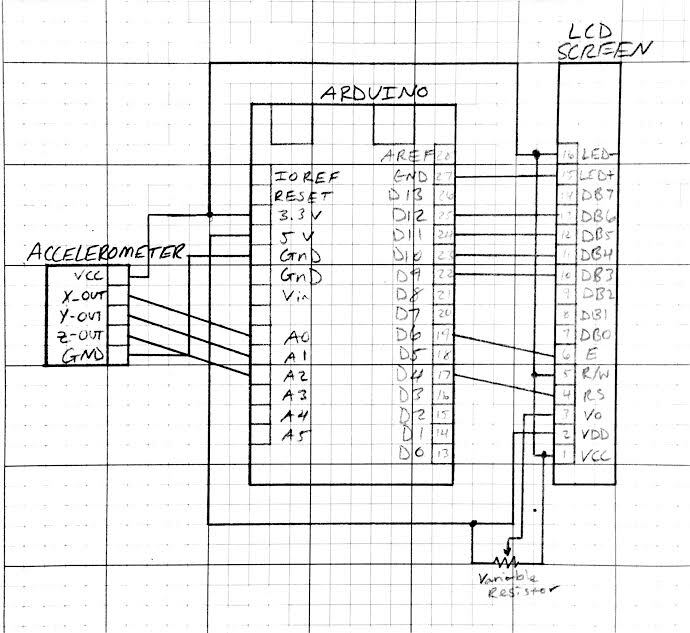 This code reads the output from accelerometer and converts the output to degrees. It then sends the data to the LCD screen in the circuit and displays in degrees with respect to the X-axis of the acceleromter.